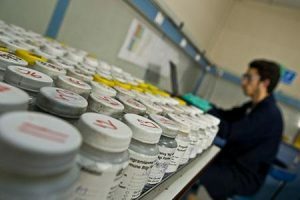 Quick turnaround – most S•O•S Services test results are available within 24 hours (or less) after receipt of the sample. Recommendations in understandable language – other labs often try to impress users with technical information. Customers appreciate the facts and recommendations in simple, easy-to-understand communications. Our S•O•S Services lab provides information about the problem and then helps you decide the best course of action. Why do you need fluid analysis services? Avoid complete failures. Often an adjustment or replacement of a single part, based on S•O•S Services findings, can prevent a small problem from growing into a major repair. Track what is going on inside the equipment. It enables you to predict wear-related problems, allowing greater flexibility in repair scheduling and downtime control. S•O•S Services tracks the wear of components, oil performance, and condition. Maintain equipment and shorten repair time. Using the S•O•S Services Report as a guide, troubleshooting time is often reduced, enabling a serviceman to go directly to the core of the problem. Since you, your S•O•S Analyst, and your Parts & Service Rep. are working as a team to manage your equipment maintenance, you can be assured that parts and shop time are readily available. Manage component life and equipment availability, thus reducing owning and operating costs. Downtime is decreased and productivity and profitability are increased!